Rebecca Kiss/Pipe Dream Photographer Junior forward Alyssa James recorded a triple-double against Stony Brook with 16 points, 10 rebounds and 11 blocks. Junior forward Alyssa James recorded a triple-double and junior guard Imani Watkins tallied season-high 29 points against Stony Brook. But despite their impressive performances, the Bearcats’ sluggish play in the second half doomed them in a 74-59 loss to the Seawolves on Saturday. After taking an eight-point lead into halftime, the Bearcats (12-15, 7-7 America East) fell apart in the final 20 minutes. BU shot just 29 percent from the field in the second half — down from a 61 percent clip in the first. Watkins led Binghamton in scoring, shooting a 50 percent clip from the field, including 5-of-6 from beyond the arc. James had 16 points, 11 blocks and 10 rebounds, recording the fourth triple-double in program history. 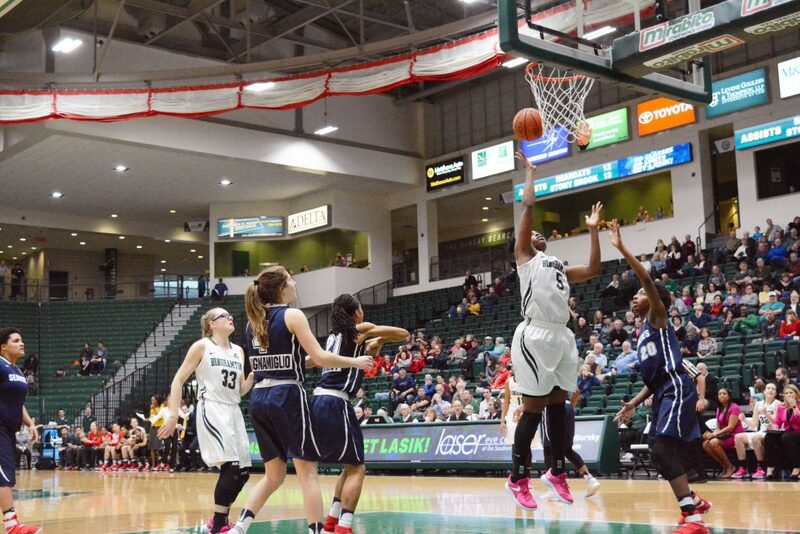 Her 11 blocks are the most ever by a player at Binghamton and in the AE. For much of the game, however, their teammates struggled. Without Watkins and James, BU shot just 6-for-19 from the field. For the first four minutes of the game, the Bearcats controlled play, going on a 6-0 run to start a strong first half. In the half, 3-pointers flew into the basket and rebounds were collected with ease. The Seawolves responded quickly after the break. SBU scored points both inside and from beyond the arc, leading to several lead changes in the third. By the end of the quarter, Stony Brook took the lead for good before clinching the victory with a 17-2 run to end the game. Stony Brook finished the day tallying 12-of-16 from the 3-point line. Driving hard into the paint was another key to the Seawolves’ victory — they went 10 for 16 from the free-throw line. Senior guard Kori Bayne-Walker led Stony Brook with 24 points. She was followed by senior guard Christa Scognamiglio, who put up 22 points. Another major contributor to the Bearcats’ offense was freshman guard Carly Boland. She scored 10 points, shooting 47 percent from the field and 2-of-2 from beyond the arc. So far this year, Boland has averaged 4.8 points per game in 14.8 minutes. BU is set to continue AE play against Hartford on Thursday. Tipoff is scheduled for 7 p.m. from the Events Center in Vestal, New York.